Rental Solution: How to hide UGLY wire shelving! Need a simple solution on how to hide ugly wire shelving in your rental? 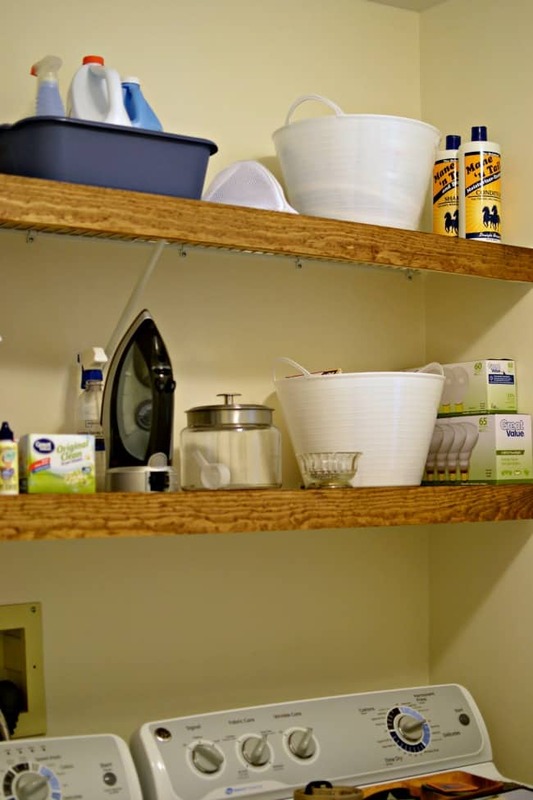 Check out this inexpensive and clever idea of getting those shelves looking great. We have always been homeowners so these past few years of renting for my home improvement and design loving personality has been a little tough. If you are new to reading my blog then just a little backstory on why we now rent. We are military and we move a lot, end of story. Okay, so not the whole story but basically the gist of it. When we moved to Kansas we had no desire to purchase a home because we knew we weren’t staying past 3-4 years tops. We discussed buying a home here since we are now back in Tennessee [our home state] but also knew that this specific city wasn’t a place we intended to stay after 3-4 years. Plus on top of it taking 8 months for our last home to sell was a big bummer and something I have no desire to have to go through every few years. So until we are settled (IE. retired from the military) renting it is. How to hide ugly wire shelving! So needless to say, I have spent the past few years coming up with ways to be comfortable in the homes that we are renting. 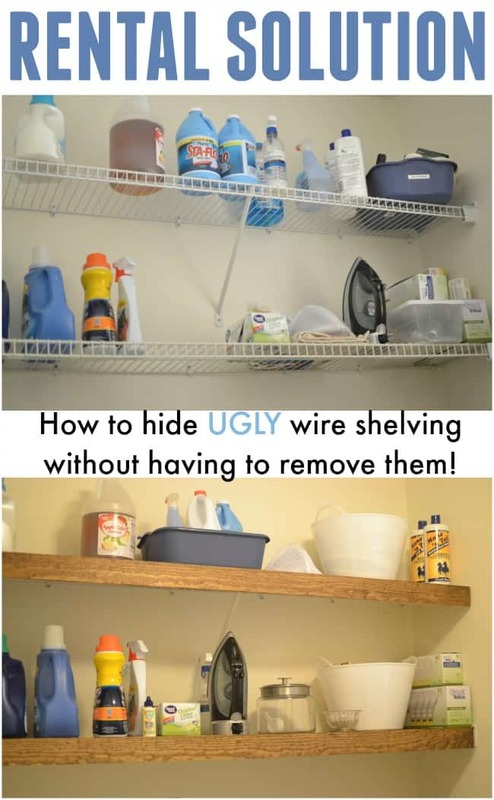 With that in mind, I wanted to share with you today how to hide ugly wire shelving that you find in just about every rental or basic builder grade homes. Even if you aren’t renting this solution may work for an inexpensive fix to your own problems as well. All we needed for this project was (1) 4×8 sheet of 1/4 inch plywood and (1) 1×4 board. We measured our wire shelving depth and length and then cut it out using a Skilsaw. Which is another rental problem, not having enough room for all the equipment you would love to have. 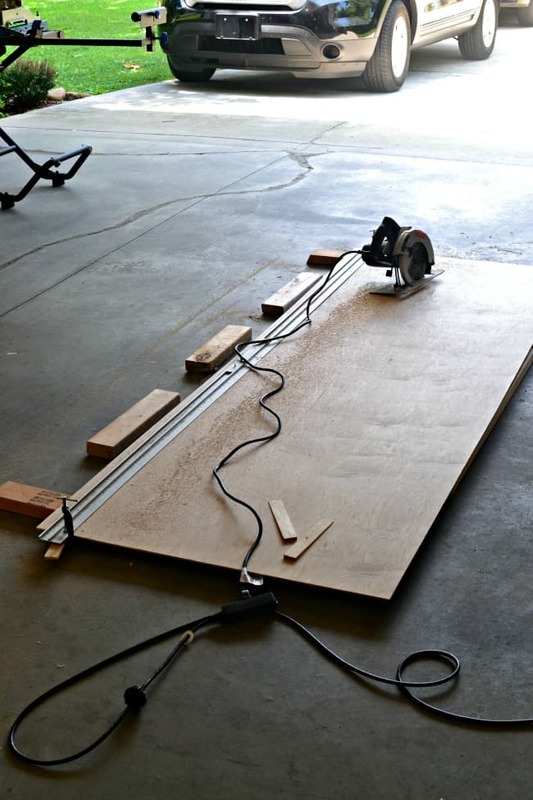 We have a smaller table saw but it won’t cut big sheets of plywood safely. Although the garage here fits 2 cars it isn’t large enough to have tons of tools plus 2 cars. I dream of the day when we can have a separate workshop. As much as we love to build furniture it would get tons of use but that is neither here nor there. 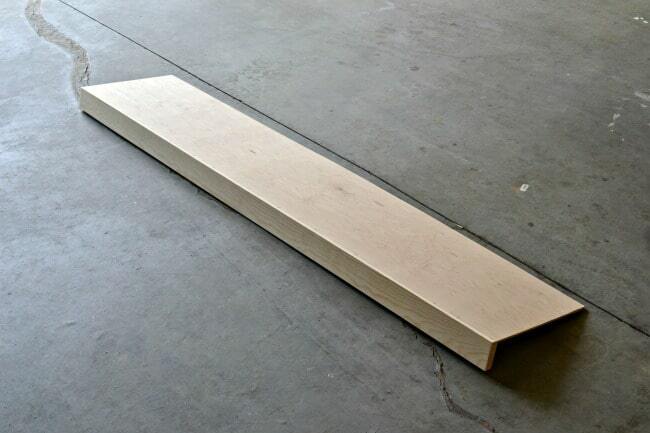 Once you got your plywood pieces cut then you can attach your 1×4 board on the end. 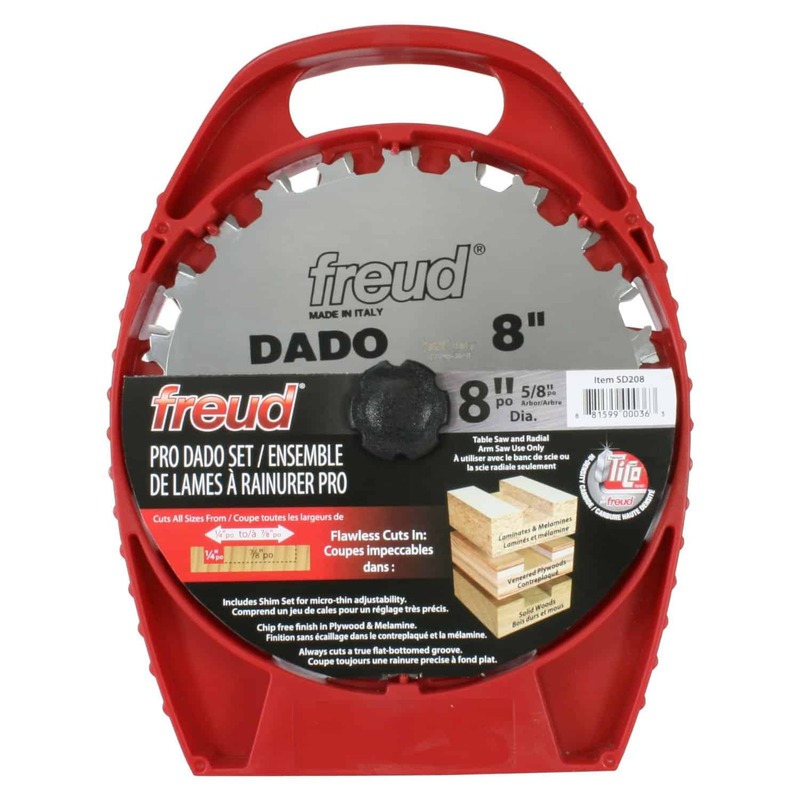 The husband being who he is decided to get a little fancy and use his dado blade to cut a notch so you wouldn’t see the rough edging of the plywood but that is definitely not necessary. That is all there is to it, minus some staining if you choose to do that. Then just slip it over the wire shelving and tada looks like you have a nice floating wood shelf [ish]. I bought a couple Dollar Tree white totes to house our dog supplies and extra light bulbs to keep everything streamlined. Don’t mind the awkwardly angled pictures. 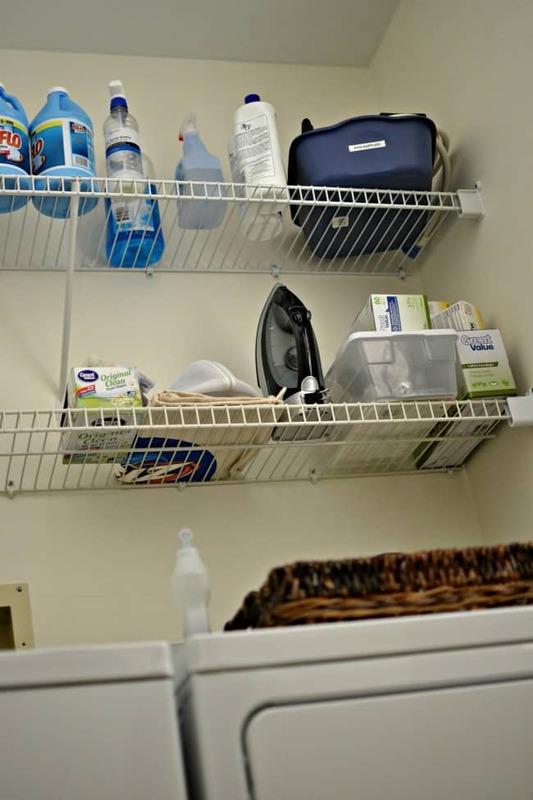 Do you know how tricky it is to take shots of a small laundry room? He didn’t really mind the wire shelving but just this little change packs a pretty big punch for a mere $15 dollars. If you rent and don’t have the option of building this floating shelve for less there are still more options. Check out this laminate shelf from Amazon. If you enjoy this how to hide ugly wire shelving post you will also probably enjoy these following articles. 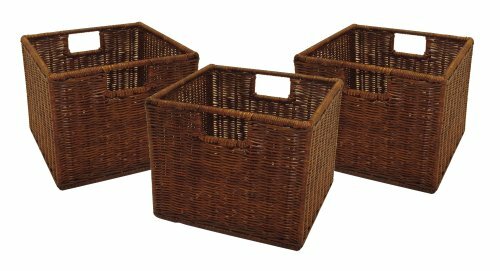 Toy Storage: Organizing your kids’ Clutter! Clever solutions for stuffed animal storage! How to store Lego functionally in your home. How to clean your bathroom in 5 minutes… or less! How to replace vertical blinds with curtains! Printable labels that will organize every room in your home! 4 Easy Steps for Lighting your Party! Jewel, you could just use wood glue and attach it but we used brad nails with an air gun. This is such a great idea, and I can use it even when I don’t rent. 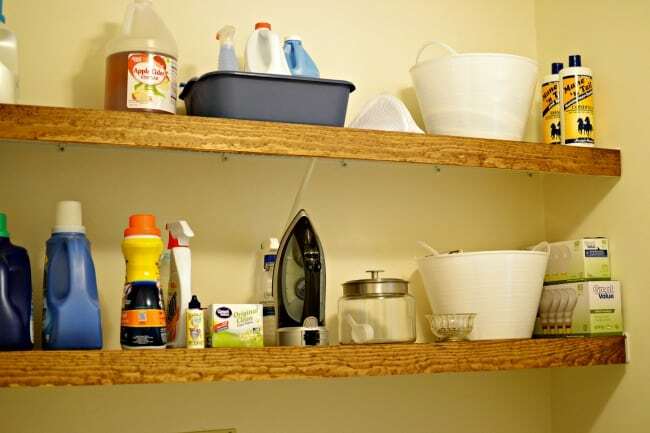 Have the same shelves but in a pantry and think will “class” it up a lot. Wonderful. Pinned . Hi Melissa! Love this idea! I don’t understand what you mean about “cutting a notch so you wouldn’t see the rough edging of the plywood.” The rough edging on the bottom edge that hangs over the wire shelf edge? Or the top edge? Can’t visualize what you mean by that. Thanks! Normally you would just have to attach the plywood by nailing it into the 1×3 board from the top. 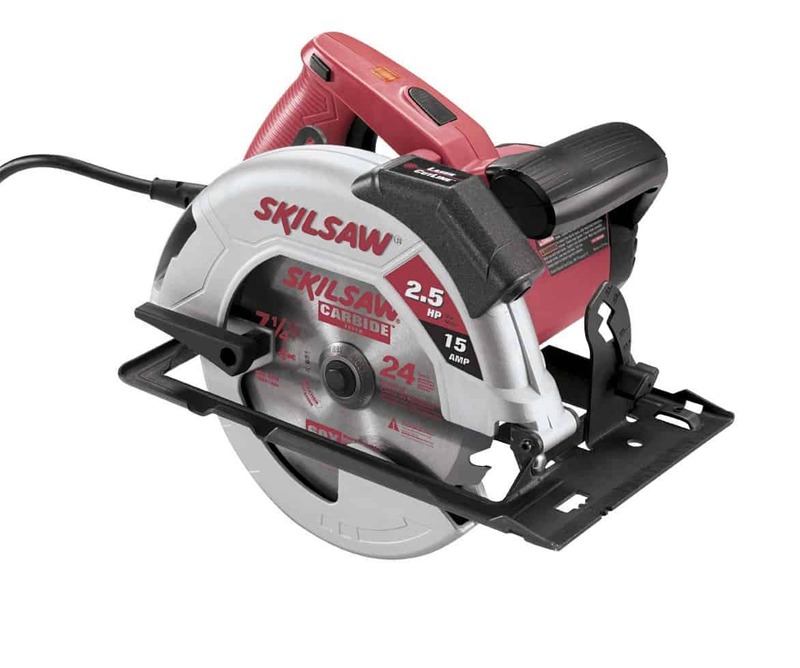 This would cause the edging of the plywood to show from the front. My husband used a dado blade and cut out a small slot of the 1×3 to rest the plywood onto so the front only showed the 1×3 facing. It isn’t complicated but kind of hard to explain. It is a unnecessary step unless you just want it done that way but it would require extra work and equipment. This is a great idea! These shelves are great because they are sturdy but I’ve never liked the way they look. What a great Hack! Such an awesome idea! 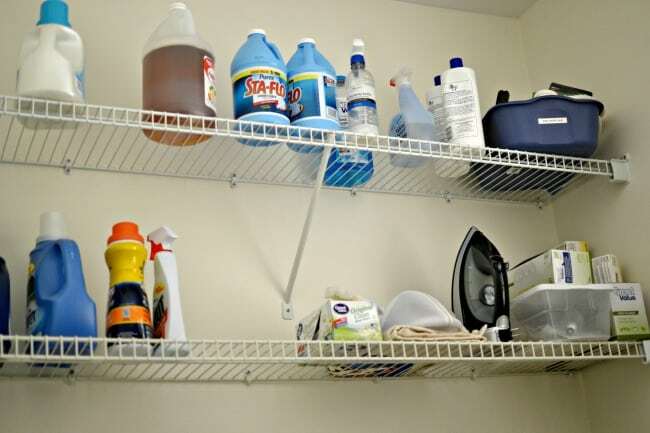 I need an inexpensive shelf for our laundry room and I’m pinning this to remember how to cover it up. This is genius! We will be renting again and this is gonna come in handy. I wish I saw this sooner. With my brother-in-law’s help to construct the shelf covers, I just added these wood covers to five shelves in my pantry and laundry room. I painted mine with primer and two coats of semi-gloss paint to match the painted cabinets in my house. Such a huge improvement at a very low cost. Hey! Love the idea I’m about to do it myself but I have a couple of questions first…. can you still hang hangers from the shelf it doesn’t look like you can if you cover it over too much? And when you grab things off the shelf does it move or almost come off since it’s not hooked to anything ? It hasn’t moved or shifted on us at all when getting things on and off the shelf. However, no you wouldn’t still be able to hang hangers there. We never used it like that so it wasn’t an issue for us but if you do use it for hanging hangers it might not work. Great idea! Im using this idea as I make over a coat closet into a home office. Ironically, I found this post because my husband retired from the military, we moved from our forever home, and are now living in military housing for the forseeable future, lol. We just moved again as well and have the same ugly wire shelving in our laundry room again. Ugh! lol Hope your home office space works out well.